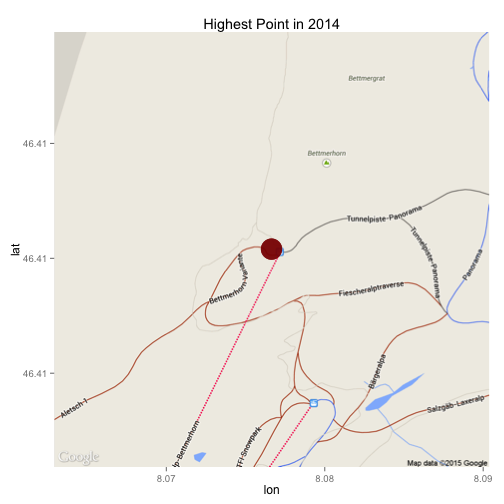 I tracked my location data with OpenPaths since the beginning of 2014. OpenPaths comes as an application for your phone, which tracks its location, uploads it to the OpenPath servers, where you can donate your data for scientific research, and look at the data yourself. To do this, we grab a .CSV file with the location data. Log in to OpenPaths, and click on CSV under Download my data, which gives you a comma separated list of your location data, which can then visualize with R, which is what we’ve done here. 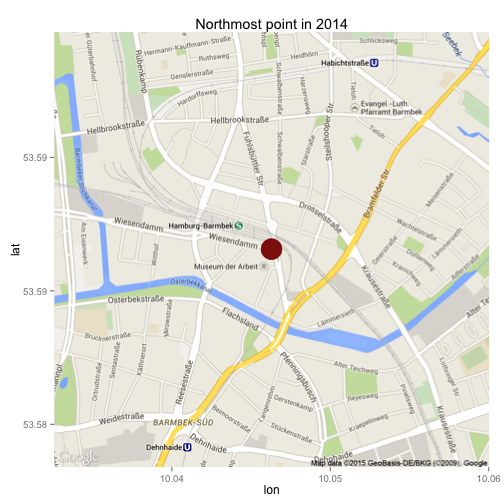 We want to plot the location points on a map, which we can do with the wonderful ggmap library. First, we load the CSV file and display a summary of the data. 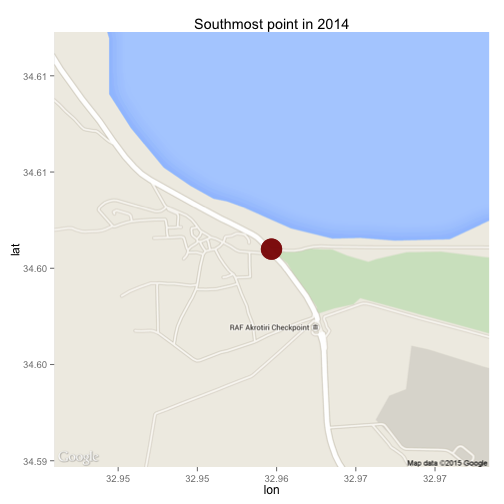 In 2014 I was somewhere in woods somewhere in Romania in the mean, and somewhere in Beromüster as the median. We see that in 2014 I changed from an iPhone 4S (iPhone4,1) to an iPhone 5S (iPhone6,2) and went through 10 different iOS version numbers. The minimal and maximal latitudes of 34.601 and 53.5866, South and North. the minimal and maximal longitudes of 4.762 to 141.1744, East and West. as well as the altitude, which ranges from -48 AMSL to 2671 AMSL. We can get the extreme points out of the data pretty easily. To do so, we subset the data depending on the value we want to have, build a Location from these points, grab the map from that location, display this map and add a pointer. 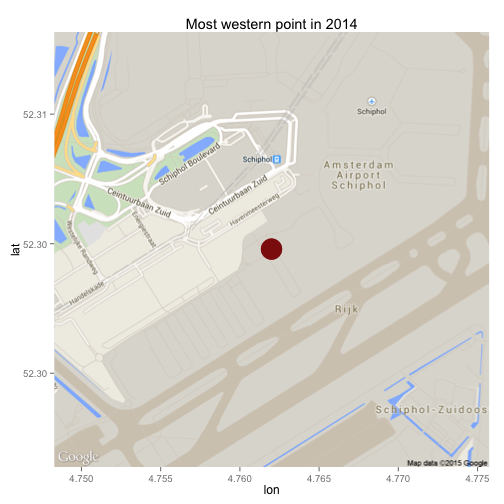 The most eastern point was (unsurprisingly) in Japan, the southmost point in Cyprus and the most eastern point in Amsterdam (while flying to Japan). 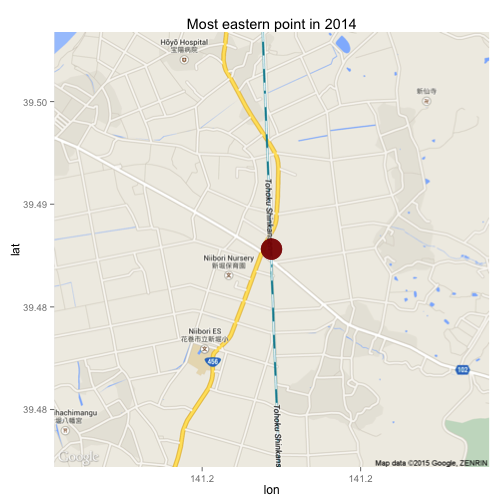 To plot the obtained data on a map, we have to center the resulting map location. Since I only want to show the data points in Switzerland, we center the map on that. 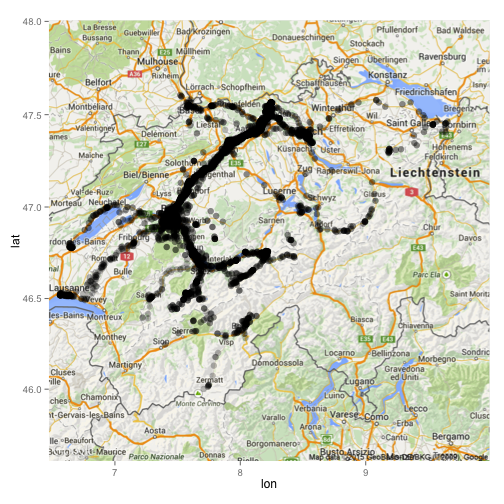 Afterwards, we can simply plot all the data points on top of that image, and you can see where I was in Switzerland in 2014. If you’d like to see the full R code (in R Markdown), you can take a look at the OpenPaths.Rmd on my GitHub account. chm, der ist für dich!